Unique innovations and advanced technology differentiate this Pacific Northwest shop with makeready reduced by 50 percent and production run time reduced by 35 percent. How does a commercial printer with nearly 80 years of experience plan for success in a fast-changing industry? 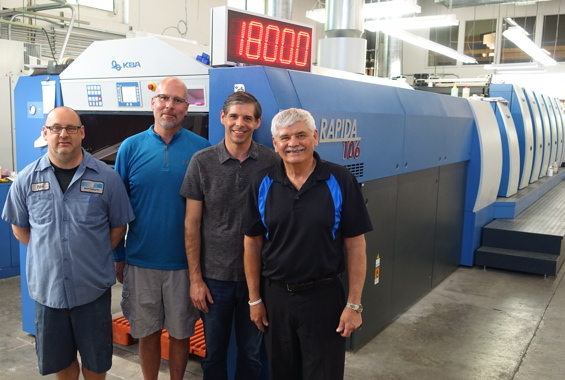 In the case of Brown Printing, a Portland, Oregon, family-owned business, it is creating a truly differentiated experience for its customers with the help of a new fully automated Rapida 106 41-inch six-color UV press manufactured by Koenig & Bauer. The firm decided to purchase its new press to maximize the advanced technologies and unique innovations from Koenig & Bauer selected specifically by its executive team to continue its growth into the next generation of ownership. Murray was also pleased with the fast start-up of the new Rapida 106 allowing his firm to bring in new unexpected business. For example, Brown has just finished a large push of catalogs that it would not have had the capability to complete without the new Rapida 106. By equipping the new press with full UV technology, Brown has been able to win new work for jobs such as specialty coating and packaging. Since its start as a family-run business in the early 20th century, Brown has evolved into a solid full-service commercial printer with offset and digital press options. Over the past eight decades, the company has built its reputation on being a first-adopter of new technology. Quality is one of the key mainstays of Brown’s success. Its customers note that Brown’s print output is exceptional and unmatched by any other printer. It was important to Murray to include the Koenig & Bauer’s QualiTronic ColorControl inline color measuring system on its new Rapida 106 to maintain its color expertise and enhanced color accuracy for its customers. This unique system uses an inter-deck camera system integrated directly into the press. The control strips can be positioned either at the front or in the center of the sheet. This ensures that printing jobs maintain color integrity on all customer work and provide limitless printing applications. Its healthy mix of high-end commercial customers from the Pacific Northwest are drawn to the firm’s personable approach and convenient location near the famous Rose Garden in downtown Portland. Customer service is one of its strong distinctions amid the current competitive landscape as well as its specialty equipment and services that help clients with projects that require letterpress, foil stamping, embossing and its ability to offer custom ink mixes. The firm maximizes the value and beauty of each of its perfectly printed products with a variety of finishing techniques such as die-cutting, folding, gluing, and kiss cutting. With a strong anchor in the commercial printing market, Brown Packaging has begun to diversify its services by adding packaging to its repertory. To accommodate a variety of run lengths, Brown is utilizing the state-of-the-art automation modules, such as the DriveTronic SIS sidelay-free infeed, on the Rapida 106 to quickly complete job changeovers and shorter production deadlines. The fast run speeds of the Rapida 106 equate to less time on-press as well as shorter delivery times. Since its installation, the press has performed at optimum conditions and become Brown’s “go-to” press. Brown Printing is a family-owned commercial printing company providing a complete range of services for clients large and small. The Portland business offers a full range of services—from simple one-color jobs to six-color inline printing with in-house foil stamp and die-cut. For nearly 80 years, it has gained a reputation for giving its clients personalized attention, professional knowledge, competitive pricing and timeliness. Using environmentally friendly practices, its goal is to provide its customers with a quality print job, no matter how large or complex.